Your return to your True Selves has been an arduous journey at times, pray tell, but my gifted ones – my lighted ones, you are thoroughly prepared and “wired” for this illustrious journey all the way to fruition. Be prepared for more refinement of your purpose and your destiny. As you enrich yourselves with the energies building and building as we speak, you may notice a lot of quivering in your Light Bodies. They are taking on greater amounts of light and so, must adjust. More pockets and packets of information will thus be opened for your awareness, and it is important that you relax and allow them to “come to light” so to speak. Your refinement may leave you feeling “lost” and “empty” at times, but it is merely the adjustment and the intake of greater energies. I beseech you to take it in stride and not to “try“ to figure it out too much, but just allow and surrender and BE. This is still a little foreign to many of you, as you often get the “call” back to what you think is your true reality and so you must “attend” to things which may or may not bring you into a lower vibration. However, this is all part of the refinement, this choosing of what you will put your attention to, and the richness of being that can result from just letting go and BE-ing with the new, strange and unknown senses – just a little while longer each time – can lift you higher and will allow you to experience the reality of the higher dimensions in a deeper and more fulfilling way, and in a more sustaining way. It is all a gradation of up-liftments and you are all doing very well. Leaving the old behind will feel strange at times, but allowing yourself to soar into unknown territory, of a greater Lightness of Being, will prove very rewarding to you and also fortify your experience and “Be-ingness” there. Take it at your own pace, dear ones, but keep lifting; keep viewing things through the lens of these glimpses of the higher dimensions you are becoming more and more privy to. For it is acclimating you to reside forever in that milieu, your rightful place. As you lift and linger in those pockets of lighter energy and view everything from that perspective, you will find that the “pulls” into the lower dimensions of needs and wants and “have-tos” will begin to slip away more and more and become much less present and “charged” for you. And so it is, as you ascend and expand and ascend into your “Lighter Truth and Being”. Nothing is looking the same, and this is appropriate, for as you change within, everything is morphed and altered; but in experiencing the sweetness of it, you will not want to go back. Look for the “Lightness” in everything, for that is where your creation is fueled, where your transformation is fueled, dear ones. It is “written in the stars”, so to speak, that you shall inherit the earth, a New Earth, and you have achieved much already to that end. Go at your own pace, but stay with your intent to absorb as much Light as you can, and to allow it to build to a crescendo within to allow an explosion of color and purity to envelop everything. 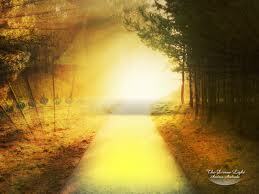 Feel and “See” yourself walking always in the Golden Light and consider it your new home. It will thus start to spread to others and envelop the world much more quickly. For all intents and purposes, much is changed and much has shifted. Move aside the veil of your lingering illusion and see your world clearly for the first time. It is your norm now. It just remains for you to embrace it, dear ones. The Glory of Creator is at your fingertips and you only have to allow it to grow in evidence for you. Sketch your intentions and dreams into the mist of this great Light that you are allowing to come forth from within, unleashed for your own betterment as well as for others. The result is not always definitive, or concrete, but that is your old way of measuring things. The glory and change is in the breath of your newly felt Lightness of Being as you lift yourselves higher with thoughts and actions of Unconditional Love for yourselves and for others, as you bathe in that Light and Love as your natural habitat from here on out. You are the peacemakers of the world and it is seeping out from every one of your “pores” of your lighted presence and Being. Enjoy the view and enjoy the scenery and get used to it. It is becoming your True Reality, dear ones. Lovely! Thank you, Sananda and Fran. How cool, Ron! Wow…how wonderful to see that in your meditation. We are definately shifting and changing and experiencing higher dimensions….I had a dream the night before the message that felt like I and we had all shifted into the higher realms, which I didnt really remember until I had received Sananda’s message and started posting it and the whole time I was reading and posting the message, I kept getting glimpses of the dream..which were so palpable…it .has stayed with me ever since, keeps coming up in glimpses…..thanks for reblogging!, and have a wonderful day! Impeccable timing. THANK YOU both!